Get ready to be shaken to your core. 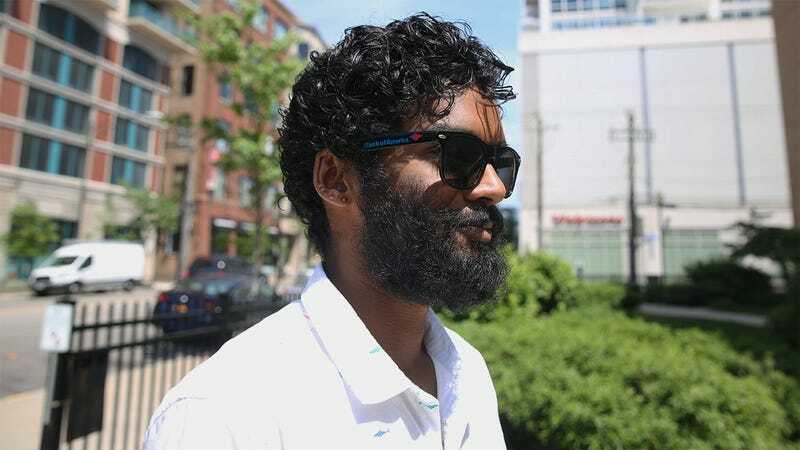 In a world with literally countless attractive sunglasses available at reasonable prices, it’s looking like the Bank of America sunglasses this guy got for free are going to be his go-to sunglasses for the whole summer. Good god. This is the kind of thing you hate to see. While it didn’t set off any alarm bells when Eric Burbank first wore the free black-and-red sunglasses he grabbed from a bowl at his local Bank of America branch, the situation took a dark turn when he was spotted doing his grocery shopping and attending a baseball game wearing the promotional item later in the week. The horrifying reality that Eric will apparently be wearing the flimsy glasses all summer long was all but confirmed last weekend when he showed up to an outdoor wedding sporting the tacky and cheap shades. Sadly, the alarming fact that these sunglasses probably don’t even protect your eyes from UV rays and should really only be worn if you can’t find your good pair and are rushing out the door doesn’t seem to have registered with Eric. Worse yet, Eric is planning on proposing to his girlfriend in the mountains this weekend wearing what we have to assume at this point will be the free sunglasses, despite being a grown man with a well-paying job and plenty of money to justify dropping even just $30 to get some decent-looking shades. Based on Eric’s troubling behavior, it appears he’ll in all likelihood even end up taking his engagement photos with this poor girl in these sunglasses, leaving untold future generations to gaze upon the “Bank of America” scrawled on the sides in disgust. Add to that the fact that apparently none of Eric’s close family members or friends can muster the courage to tell him that you just don’t wear free promotional sunglasses unless you’re doing yard work or something, and this painful situation doesn’t appear to have an end in sight. Ye-ikes. Here’s hoping someone steps in and saves the day by giving Eric a spare pair of their sunglasses to use this summer before this gets any uglier.